"Komodo Dragons are the world's largest lizards, with the record male measuring more than 10 feet long and 365 pounds. The animals you see today are relatively unchanged from their ancestors that existed over 4 million years ago. Komodos use their forked tongues to smell dead animals, their most common food, from several miles away. 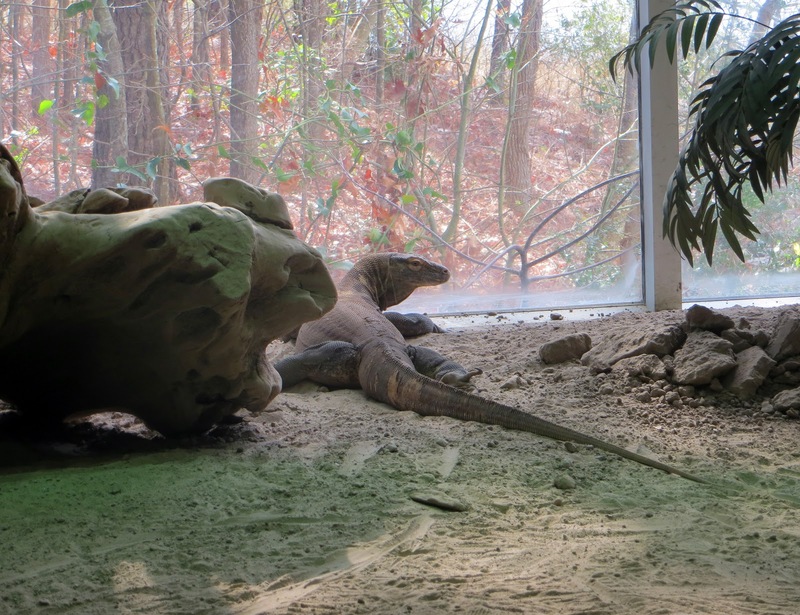 Virulent bacteria picked up from eating rotten flesh thrive in the Komodo's saliva. When dragons choose to attack live prey, the bacteria can infect and kill their victims within days." I've heard of these things but have never seem them. And I'm pretty sure if I did, I'd need to change my pants. I certainly wouldn't be stupid enough to go inside their cage. Here's one, staring out the window, probably contemplating what it would be like to be free. And here's a very short (20 seconds) video of the other one, digging in the dirt. I'm pretty sure he was carving out their escape route.